Like any successful process, proper preparation is the key to a fully realized expectation. We have produced many award-winning pieces and campaigns. They all begin with proper attention to detail in the prepress stage. A single, well tested and proofread file can become the parent to bring forth the multitudes of the press run and the satisfaction of knowing they will all look and perform as they should. Digital printing should not mean sending it to a copier. Print buyers can now function like the extension of the marketing department that God had actually intended. If you can appreciate the difference in the taste of fresh ground coffee, you’re gonna love the difference digital, on-demand, offset printing brings to the table. Let people know who you are and what you can do. Make your message big and colorful and impactful! R.O.I. your next trade show experience with a one-to-one marketing campaign to “touch” those folks you met at the show - make that sale! At ColorFile VCS, it is our goal to exceed any and all expectations. This translates into hard work, dedicated involvement and high quality equipment and techniques to deliver the impressive results our clients have come to expect. We are firm believers that craftsmanship must still exist in the digital domain. 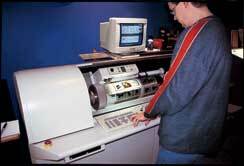 ColorFile VCS operates one of the largest and finest multi-laser film image recorders available. Our internal drum device operates with all the calibration the rest of our digital workflow enjoys. 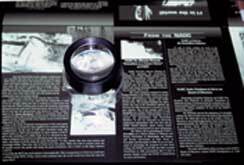 Film negatives and positives can be produced for lithography and silk screen applications. Our digital offset solutions deliver fabulous, high intensity color press results like you would expect from conventional press runs. For example, our HP Indigo press actually has a color gamut greater than CMYK ink has ever seen before in print. Finally your print pieces can be as fresh as your content. Print only what you need. This is a whole new way of thinking about buying print. In a fast-paced world where details change all the time, your print project can now keep up with your world and have you looking sharp all the way. Do you need materials right away? We know you do - and we do it all the time. Does your print item smell like the warehouse it was stored in? You know what a fresh concept smells like. Let’s make fresh! “Wow - a printing company that can produce my signage, trade show needs, large format projects and street graphics. Incredible!” Yup, it’s true. What makes this so appealing to so many of our clients is simple. We approach our involvements in these requests like the quality minded printing professionals we are. Anyone who has had a project produced at a local sign shop or chain will really appreciate how great our product looks. Your signage will color match your print work - sounds simple, right? Well, we think it should be, too - and we’re prepared to show you just that! Calibration is the key. We have made painstaking equipment choices to deliver the finest results possible with each request. Resolution, calibration and our involvements deliver smooth, crisp, color accurate products for a multitude of requests. POSTERS and BANNERS and MORE! ColorFile VCS runs large format Epson equipment boasting a 200 year color fastness condition with all the vibrancy and consistency possible from your files or ones we will help build for you. A multitude of substrates are available. Ask your ColorFile VCS rep to guide you in your choices. That’s it. That’s the key. ICC Calibration. We will anticipate the production print condition of your files and images with the greatest amount of ICC color calibration possible. This process will yield a SWOP proof that is consistent and accurate to the parameters we’ve identified as critical for matching that result in the next step of the process. The International Color Consortium (ICC) is a group of experts who have defined the digital color standards for everything digital - from displays to output. Specifications for Web Offset Printing (SWOP) represents a similar group of color experts that have worked to establish and maintain the criteria for press room results. Web print production requires a close tolerance for high volume printing. Sheet fed print operations often follow these SWOP guidelines and will modify them to accommodate their internal conditions. When appropriate, a color house, like ColorFile VCS, can “fingerprint” a specific calibration requirement to an external or specific benchmark. This is useful in the example of files and runs to be done locally or for targeting, then disseminated globally for rollout production. ColorFile VCS is fully prepared to work with your supplied files. Our staff is highly knowledgeable in all disciplines of graphic preparation and can make changes or repairs as they become necessary. Images that need to be captured can be done with our talents. Our digital and film camera artists can come to you location or provide studio set-ups inside of our plant as your needs require. Artwork that needs to be digitized will be handled with the skills of color separation specialists who cut their teeth back in the days of process cameras and panchromatic films. Once files exist, changes and alterations may be required. Our team of image professionals can handle everything from text edits and formatting to photo-montages and high fashion retouching. After all tweaks are made, your files will be arranged in press impositions to go to one of our many print devices. Ooooh! Data-mining. Hot topic. Let’s print your project with personalization. Statistics show that the deeper the involvement of the personalized interest, the greater the return on the investment of reaching your audience and pushing out sales. There is a whole strategy to pushing out sales with one-to-one marketing. Our personalized print process is the start. Speak with one of our marketing specialists to design a campaign that has your sales graph looking like it should! Packaging prototypes and other comps can be brought to life with all the brilliance of the final product, but in a careful, controlled and impactful method that allows proper analysis for focus groups or to introduce new products for trade shows, conventions and sales seminars. Will you be sending an ad to publication? ColorFile VCS can produce a “halftone” print of your ad in full 4/C/P and a progressive press proof. Did you ever get your tearsheet back from the “pub” and wonder where it went wrong? Don’t let that happen again. Allow ColorFile VCS to pull a press proof and send a set to your publisher and pull a proof for you to keep to compare, the day that tearsheet comes back to you.You’ll be glad you did. Large format pieces as well as short and medium run press runs can be film laminated with one of our many in-house hot or cold solutions. Gloss and satin, textured and smooth and everything in-between is possible. MOUNTING and MATTING and FRAMING! Anything we print can be mounted to a substrate of your choosing. Custom shapes can be included to create the finished piece you’re thinking of...! We can even mat and frame your art for home or office - no, really! TRADE SHOWS and CONVENTIONS and EXPOSITIONS! Here’s that argument for calibration, again! Who wants to be disappointed at all, but especially when a conference or trade show sneaks up on your schedule. No worries! We can produce your campaign for your next show or event. Our involvements can be as simple as fresh panels for your system or a full blown event condition that delivers everything from table tents to the gear to hang your panels on. While our printed work will be custom to your needs, the hardware or gear can be rented for events as you require. Why not consider to have your graphics illuminate! Don’t forget to include a one-to-one marketing piece to follow up with show attendees. How much did your firm spend to be at that trade show? Well, we’ll bet it’s a lot more than you would spend on anything else without a proper R.O.I. analysis. Let’s improve the return on that event. Use the card swipe feature of attendees to your booth to do your datamining, then let ColorFile VCS merge that data into a meaningful campaign that turns those“visits” into sales! We’re not talking about spotlights or downlights (we do that, too!). AdLux involves the integration of L.E.D. or electroluminescent lamping panels to embellish your product, theme or in-store promotion. These lamping choices will be built into your graphic panels as best suited to deliver impact to your needs. We can do onesy-twosy’s or hundreds or thousands. Ask your rep to describe the possibilities! 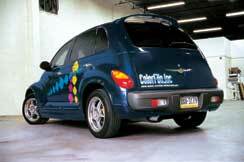 Need a vehicle wrapped - how ‘bout your fleet?... 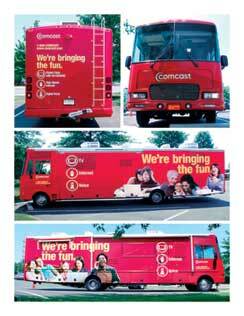 ColorFile VCS can design a campaign that will turn heads and drive interest. Our installers will install at our indoor facility or come to your location. OK. So you’ve chosen ColorFile VCS to be your provider. Let’s make sure we get it there in time. ColorFile VCS operates its own vehicles or can dovetail a project with scheduled delivery through private, common or postal carriers. Electronic, domestic and international shipments are no problem. Let’s pick the one that works best with what you need. ...where to go when you want it done right!